Difficult start of the warmed diesel engine as opposed to the easy cold start can be caused by the high pressure fuel pump malfunction connected with the plunger pair wear. When fuel warms up, its viscosity decreases and hydraulic losses in clearances increase. 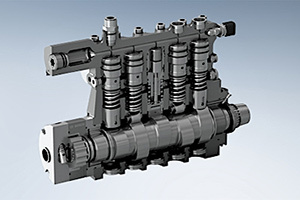 In this case plunger piston cannot make enough pressure to open the injection nozzles during the engine start and fuel is not transferred to the combustion chamber. In the modern diesel engines fail of the warm start may be connected with malfunction of the sensor of the operating injection nozzle. One of the engine nozzles is equipped with the engine temperature sensor. By cold start of the engine this sensor gives a command to change the injector spray angle and to warm up fuel in the filter (if the engine is equipped with such a system). If the sensor is broken, then it gives the same a command by warm start as by cold start. As a result it leads to overfueling, appearance of vapour locks in fuel lines and the engine start is hard. After treatment of the fuel system with XADO Revitalizant® it is strongly recommended to use Jet 100 FuelPumpProtectDiesel – Agent for protection of fuel system (Diesel) once per 6,000 miles of run in order to protect the high pressure fuel pump from possible application of low-quality fuel and from future wear of plunger pairs. By malfunction of the engine temperature sensor on the operating nozzle the sensor should be replaced.